Frozen. It’s the latest Disney offering that has achieved worldwide success over the Thanksgiving period, and for good reason too. I was fortunate to watch the film over the weekend. I decided, you know what? I’m going to make this a family affair and book tickets for my siblings aged between 16 and 21 and mother. My siblings weren’t that thrilled with the idea of potentially being the only mature ones in the theatre. In the lead up to the release I made it known how excited I was about the film’s debut. I watched all the behind the scenes videos, read as many articles as I could find, followed every link, post, group covering the film. So yes, my expectations were high, and the film did not disappoint. We laughed, we cried, we sang along (well I did). When we left the cinema I asked my family what they thought. They loved the film and didn’t expect it to be as good as what it was. So I asked for their honest overall rating for the film. 5 out of 5. 5 out of 5. 5 out of 5. Disney has truly done it again – created a magical world that explores so many different aspects of true love and sacrifice, for not only the greater good, as well as love, but for family. There were a variety of loveable characters and situations that tug at the heartstrings. I was looking around the theatre. I saw many young families as well as families, like us, who grew up watching classic children’s films. Yes, many people can criticise how Disney has evolved especially when looking at the latest developments in 3D animation, adapting to the times and the advancements of new technology. All I can say is that not one person left that cinema scowling or disappointed. The thoughts of everyone in that screening can be summarised by the declaration of one little girl, who at the end of the film exclaimed to her father and sister, “I want to see it again.” That is exactly how we felt and very rarely do I go to the cinema to see a movie twice. I most definitely will watch this again. 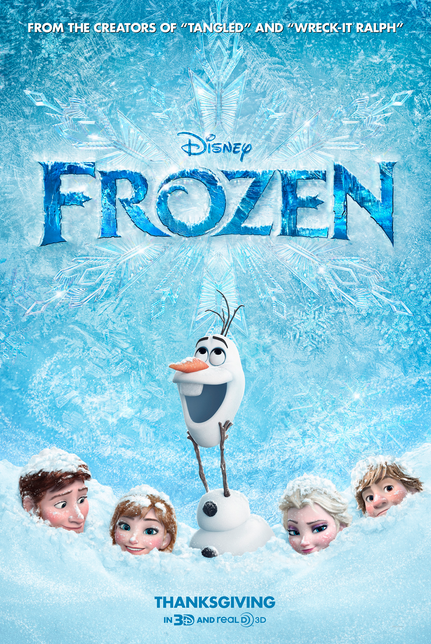 Do yourself a favour, go watch Frozen!